Posted on Feb 27, 2015 by Appleton Downtown Inc.
Bring your own gallery and enjoy a day of golf and laughs where fun is par for the course! And don’t forget team costumes are encouraged! 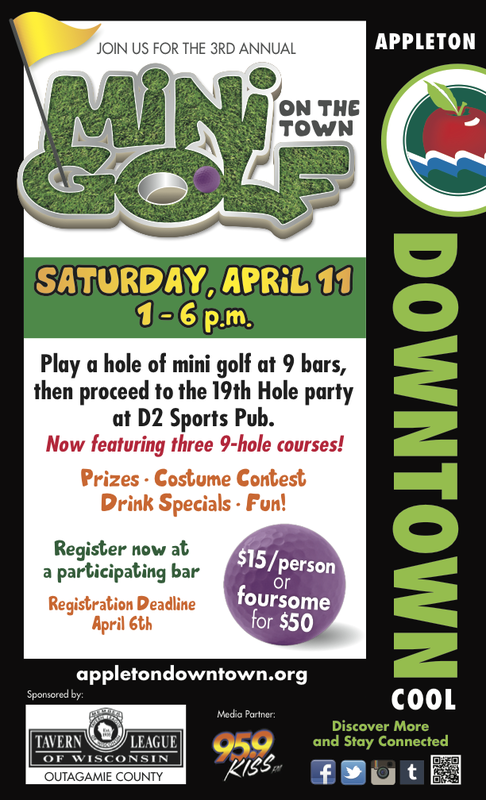 Pick up your Mini Golf on the Town Score Card at the bar you registerd at and map out your course in any order. Play all 9 holes to be eligible for prizes. End the tournament and bring your score card to the 19th Hole Party at D2 Sports Pub (formerly Anduzzi’s Sports Club) at 5pm. We’ll be giving away a $1000 Prize Pot including: best team costume and more!